I’ve always wanted to see the original PELHAM 123, which start Walter Matthau. I really didn’t have a ton of interest in seeing the remake, other than for the fact that I’ll give any suspense flick a shot. I didn’t realize before putting it in, however, that the remake was a Tony Scott film. I love Tony Scott. You know a Tony Scott film when you see it, with his unique color schemes and color filters, his removal of frames in action shots, and the way he pans across his establishing shots. I also didn’t realize, that in the five movies he’s directed since 2004, four of them have been Denzel Washington vehicles. In order they are MAN ON FIRE (2004), DEJA VU (2006), PELHAM 123 (2009), and UNSTOPPABLE (2010). In that time, only the 2005 film DOMINO was not a Denzel movie. Go figure. I watched THE TAKING OF PELHAM 123 (2009) on 5.2.12. It was my first viewing of the film. I enjoyed this film more than I thought I would. 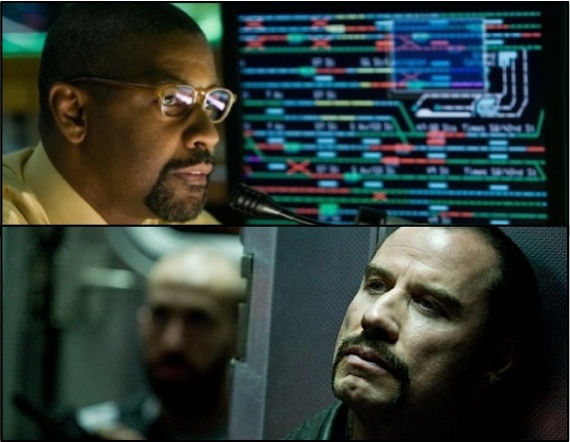 I like Denzel as a hero, and I like Travolta in this sort of villainous role. I hoped for an enjoyable movie which was little more than a throw away remake. Instead, I was rewarded with a taught little thriller with a bit more subtly than I expected. James Gandolfini has a supporting role as the mayor overseeing this crisis as Travolta demands a 10 million dollar ransom in exchange for a train full of hostages. Washington is the everyman worker who is picked by the villain to serve as negotiator. Two of my favorite moments would be cutting room floor fodder for main directors. The first occurs when Gandolfini decides to answer the press. He wasn’t going to say anything, but someone throws out the word ‘terrorist’. Being a New York City movie, Ganfolini stops to address this, hoping to allay any fears. He is rewarded by another reporter who sticks a microphone in his face and asks “Do you have any comment about your divorce?’. Nice commentary on the media, unable to properly report a crisis and instead digging for gossip. The second occurs when the guy who normally would be the negotiator (John Turturro) is riding in a helicopter with Denzel and says something to the effect of “I love seeing the city like this. It reminds me what I’m fighting for.’ It is just a really nice quiet moment in an otherwise loud movie. But the suspense here works, despite the fact that most of it has Washington and Travolta communicating over radios. Scott, as he did the following year with UNSTOPPABLE, does an effective job of making an exciting experience out of a movie which could easily become stale. Is the ending perhaps a too coincidental button? Sure. But the movie has earned it when it gets there. Nice script, nice look, solid actors who aren’t asked to stretch too much. Fun story, solid action, visceral danger. You can do a lot worse than the remake of THE TAKING OF PELHAM 123. ~ by johnlink00 on May 3, 2012.